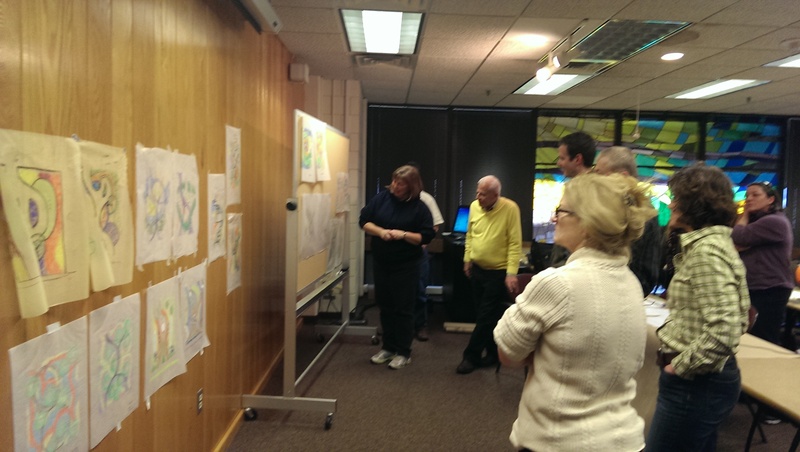 This past January, APLDOH sponsored an advanced design workshop in Columbus, featuring renowned landscape architect and professor, Darrel Morrison. He taught for years at the University of Wisconsin and is dean emeritus of the University of Georgia College of Environmental Design, and an expert in landscape and stream restoration. Darrel offered a memorable day wherein the participants experienced hands on his philosophy of ecological-based environmental design. Darrel is a humble man, and seemed the prototype of a reserved Iowa farm boy, but his beliefs towards landscape design are bold, and his being exudes his philosophy. In the late sixties, after spending a few years as a landscape architect working with the usual pallet of plants, he found the designs boring and lacking life, and he began to emulate nature, using native plants in the creation of plant communities. Though he now lives in New York city, and has lectured around the world, he is not far removed from his roots in the soils of the Midwest. Darrel used a good old slide projector as well a PowerPoint presentation to show some natural landscapes which served as inspiration for designed landscapes, and then showed how he designs to create them. His method of ecologically-based design matches plants with the existing environment, and are created to allow the plants to evolve and change together, offering diversity and life, rather than being “frozen in time” like clipped lawns and hedges that never change. The plantings utilize vegetation native to a region because those plants are adapted to the environment and foster biological diversity. He designs in his sox for better feel, uses music for inspiration, and uses the broad strokes of pastels on taped-on-the-wall brown wrapping paper to create his initial conceptual designs. 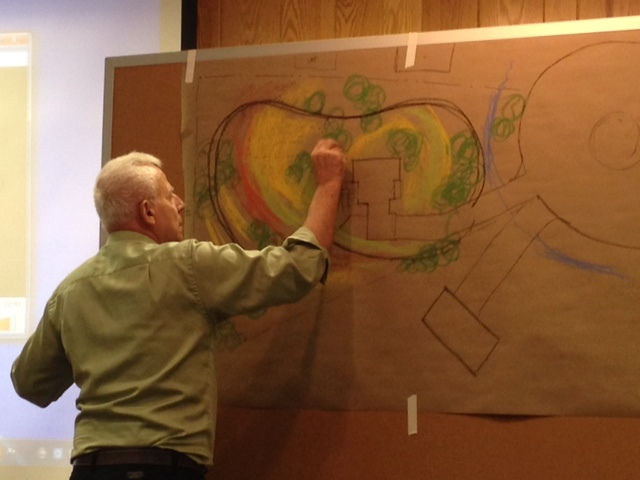 During the workshop, participants developed designs using this approach, urged to draw upon the emotional as well as environmental qualities of a site, utilizing the music for inspiration. Exercises involved creating quick conceptual designs with chalk pastels inspired by some of Darryl’s favorite musical pieces. Being buoyed by the music, the students freed themselves a bit from inhibition and found that they were led to exciting forms that might never have come out of a purely rational, engineered approach. 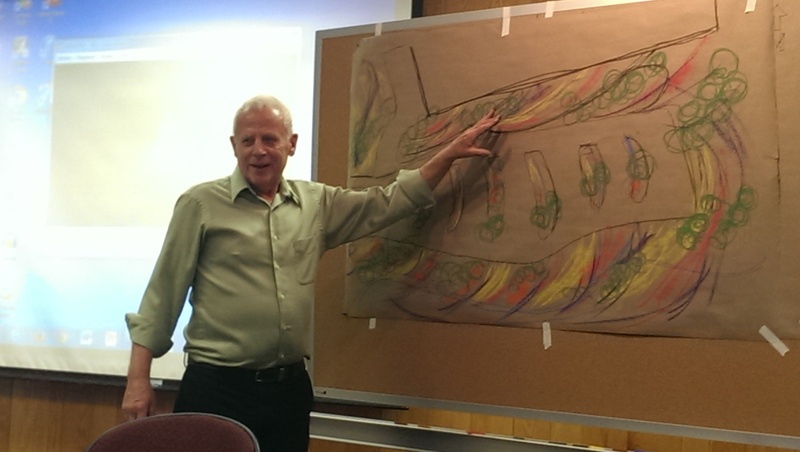 Darryl’s workshops offer a musical adventure into designing naturally, a method that he has practiced decades before the terms green and sustainability gained popularity. Darrel has not written books and does not have a web site, so might not be as well known as he ought to be, but I encourage anyone serious about the field of landscape design to make an attempt to attend one of his lectures or workshops. This entry was posted in Uncategorized and tagged Darrel Morrison, designing to music, ecologically based design, landscape design, naturalistic design on February 25, 2014 by apldoh.